Bring on the New Year. – All in a Day……. So the Christmas rush is over and you have just said good bye to 2014. Did you welcome in a brand new year? Or were you repulsed that you are a year older? Are you making a new start? Will you see 2015 out the way you intend to today? Will you fall of the speeding wagon? I already have. “Mmmm… have I put on weight or did these pants somehow go through the dryer and shrink a little?”. It’s January for goodness sakes WOMAN! You haven’t used the dryer. You have put on weight. Alas! I enjoyed every second of the festive season. The slothing on the lounge, on the beach, in a Café’, in a restaurant, in the back yard or in my pool – I have slothed like a lazy cat in the sun – in every place I could possibly think of! I have eaten sooo…. much crap! I have eaten chocolate, lollies, pizza, bread, bread, bread, ham, chocolate, ham, chocolate and more bloody ham – in fact I reckon if I tilted my head to one side, a piece of ham may fall out of my ear! I have eaten Lindt balls until I could barely move, and just when I thought I couldn’t stuff in another one – I sure as hell found room for another 1 or 2! So what was your New Year’s Resolution? Did you make one? I did! I make the same one every year which is to “Worry less about the small stuff” – however, by 2nd of January, I had already worried myself sick over something petty. I have since realised it is just the way I am programmed, and I don’t think I will ever be any different – it’s a work in progress, I am a work in progress. Our genetic program plays such a big part of who we are (no scientific break-through here), however, we can override our stubborn tiny genes and make some changes IF the desire is strong enough. I have always had a day dream that I will become a Gourmet Cook, one of these days I will love cooking, and make some amazing dishes. I have often seen myself with my hair in a loose bun with a pretty pink apron on, waltzing around my pristine white kitchen, smiling and singing as I deliver beautiful meals to my perfectly groomed family. 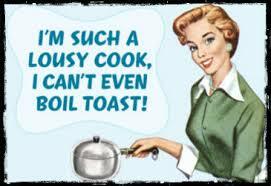 At 40+ years of age this is not happening – I still hate cooking and I still cannot cook very well. Poor Cecil and our perfect children! If they have to eat another spaghetti bolognaise made by me, they too will tilt their perfect little heads and have spag bol leaking from their ears. My Mum is not and was not a cook, and for years I have blamed her for not teaching me this basic skill (I blamed her for not getting a cooking gene and then for not passing it on to me). I have faced the fact, it is not Mum’s fault. My common sense has many boundaries, and for an unknown reason, I refuse to want to learn to cook, I have no patience for cooking and I hate being in my kitchen unless, of course, I am eating! 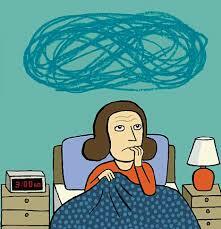 All in all, I have painted a picture like this: I am chubby little lady, who worries and panics far too often. I cannot cook to save the life of myself or my family. Bring on 2015 – with your good genetics, your bad genetics, good meals or bloody dreadful meals, worrying less, cook spaghetti bolognaise less and cheers to beating those tiny little stubborn genes!